This just in from the fabulous folks at W Hotels of New York who are proudly announcing their most fashion-forward offer, the Catwalk Package. This limited-time, exclusive package offers style aficionados the opportunity to view a runway show at Bryant Park, relax in style backstage at the W Hotels VIP Backstage Lounge, and enjoy the best of Fashion Week in true W Hotels style. In addition to these benefits, a portion of all proceeds from the sale of each package will be generously donated to Dress for Success. “The Catwalk Package is a unique way for W Hotels to set itself apart from other luxury hotel brands by offering our guests the once-in-a lifetime opportunity to be a part of Fashion Week. With the Catwalk Package, our guests are able to enjoy Fashion Week as celebrities and models do-in the lap of luxury,” says Eva Ziegler, Global Brand Leader, W Hotels. - Go Trendsetting - Be the first to see this season's fashionable offerings with 2 invitations to a Mercedes Benz Fashion Week runway show at Bryant Park. 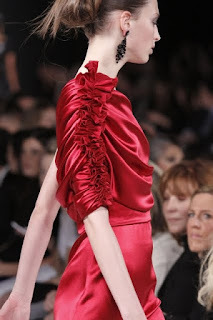 This season, tickets to the following shows are available: BCBG, Nicole Miller, Lacoste, Herve Leger, Custo Barcelona, Carolina Herrara, Tracy Reese, Badgley Mischka, Max Azria, TIBI, Nanette Lepore. - Party - Hang out with "Who's Who" in the invitation-only exclusive backstage tour in the exclusive W Hotels VIP Backstage Lounge, which will offer a sneak peek at new W properties such as W South Beach, W Retreat & Spa-Vieques Island and W Barcelona. - Give Back - 10% of your VIP Catwalk package proceeds will benefit Dress for Success. Tickets are subject to availability. Pricing starts from $969 per night based on double occupancy. To book, call Sasha Proano at 917-534-5946. For more information, visit www.whotels.com/catwalk. Tres jolie!